When you think of Clayton Kershaw, you probably think of some of the best pitchers in baseball history. He’s certainly earned the right to be talked about among guys like Randy Johnson, Pedro Martinez, and Sandy Koufax, even if he still has a long way to go before he matches them in career value. At the very least, you probably think of the game’s other aces, like Jake Arrieta, Noah Syndergaard, Chris Sale, and David Price. You should also think of Kyle Hendricks. Kyle Hendricks?! I can hear you say through the internet’s system of tubes. Why would we think of Kyle Hendricks when we think of Clayton Kershaw? Well, they have something in common other than being major-league starting pitchers in the 2010s. Kershaw is having an amazing run due in large part to his otherworldly strikeout and walk numbers. Hendricks can’t compete with those marks, but he’s doing something else extremely Kershawian lately. He’s mixing a low fly-ball rate with a very high infield-fly rate. If you’re a pitcher, the best thing that can happen in a given plate appearance is a strikeout. If you let the batter put the ball in play, that might result in a hit. If you walk the batter, he’s getting on base for sure. Strikeouts are the best possible outcome. The next best outcome is an infield fly ball. While they drop for hits every once and a while, they’re basically just as good as punch outs. Big-league fielders almost never drop infield flies, so if you have to let batters make contact, you’d like them to hit pop ups. If they’re not hitting pop ups, you’d prefer they hit the ball on the ground. While ground balls fall for hits more often than fly balls, the overall damage is less severe because ground balls can’t fly over the fence. That’s a long way of saying that ideally you’d want batters to hit pop ups and ground balls more than line drives and fly balls. It turns out, however, that fly-ball rate and pop-up rate are correlated pretty strongly (~0.57 R^2 for the sample below) based on the kinds of pitches that induce both. In other words, it’s difficult to collect a lot of pop ups without allowing a bunch of regular fly balls. It’s not impossible, but it’s uncommon. Here’s a graph that covers the last two-plus MLB seasons for pitchers who have thrown 200 or more innings. This is fly-ball rate plotted against infield-fly rate. The blue dot? That’s Clayton Kershaw. Roughly 29% of his batted balls are fly balls and 11.5% of those fly balls are infield flies. 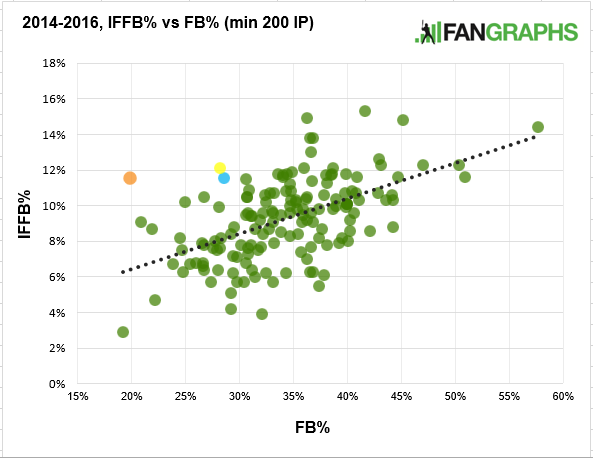 The yellow dot is Kyle Hendricks, who is running a 28 FB% and 11.2 IFFB% since 2014. He’s actually marginally better than Kershaw in this respect. Kershaw and Hendricks aren’t shocking outliers on this graph, but they are two of the best three pitchers in the league when it comes to limiting bad fly balls and generating good ones. No one gets more infield flies with fewer normal fly balls than Kershaw and Hendricks. You’re likely curious about the orange dot. It’s Dallas Keuchel. A regular reader of FanGraphs probably isn’t surprised that Hendricks is performing well. He’s exactly the kind of pitcher we often praise. Solid strikeout numbers, low walks, few homers, and a good ground-ball rate. 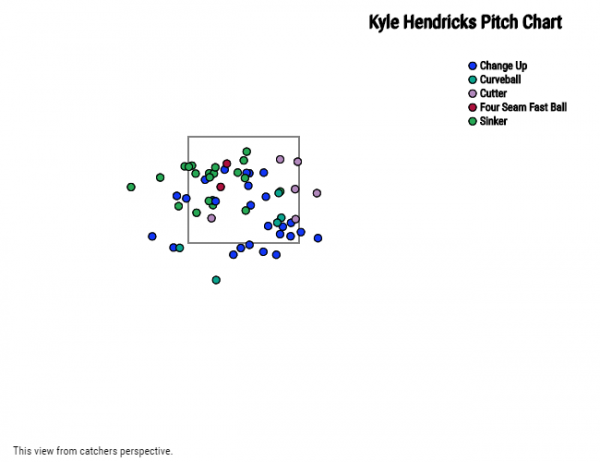 If FanGraphs were a pitcher, it might be Hendricks. In fact, our model likes him even more than his FIP indicates because we treat infield fly balls as strikeouts when computing WAR. His sinker generates the majority of his ground balls, but the changeup is useful in that respect as well. On top of that, his changeup is also his swing-and-miss pitch, generating a swinging strike about 22% of the time when he throws it. In fact, you’ll notice that when Hendricks throws his changeup low, he gets swings and misses, but when he throws it high, batters make contact. It’s not totally clear where the pop ups come into play. Hendricks gets batters to swing and miss when he buries the changeup and gets them to hit the ball on the ground when he throws the sinker. The pop ups, meanwhile, don’t necessarily fit with the overall body of work. It makes sense that Hendricks doesn’t allow a lot of normal fly balls, but it’s not entirely clear why he also has a pretty solid infield-fly rate for a pitcher who otherwise doesn’t induce air balls. Perhaps it has something to do with the way hitters get caught looking for the sinker versus the changeup and vice versa. 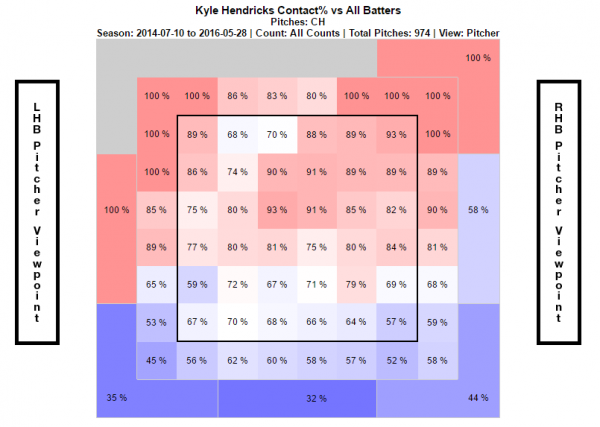 Hendricks has recorded an average strikeout rate, low walk rate, and limits the damage on balls in play. While his high ground-ball rate suggests he might start allowing more hits, the fact that his fly balls skew toward pop ups protects him from too much regression in the BABIP department. Hendricks hardly ever throws a breaking ball and sits 89-90 with his fastball, but he’s been one of the more effective pitchers in the league over the last two-plus years, sitting 26th in WAR since this date in 2014. He doesn’t look like the kind of guy who scouts would peg as a #2/#3 starter, but he’s shown that’s exactly what he is over his first 54 major-league starts. 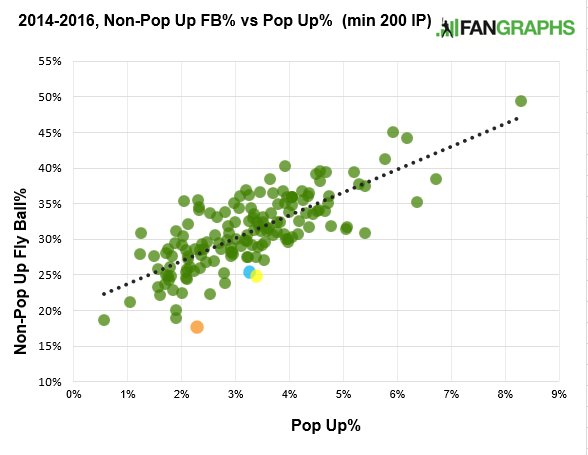 In fact, if you’re interested in high pop-up, low fly-ball pitchers, there’s two names that come to mind: Kershaw and Hendricks. We hoped you liked reading The Way Kyle Hendricks Is Exactly Like Clayton Kershaw by Neil Weinberg!